It’s not yet clear why electronic monitoring equipment didn’t detect the leak, Owen told the Asssociated Press. Owen said the pipeline was shut down immediately after the leak was discovered. The pipeline is buried on a hill near Ash Coulee creek, and the “hillside sloughed,” which may have ruptured the line, she said. True Cos. has a history of oil field-related spills in North Dakota and Montana, including a January 2015 pipeline break into the Yellowstone River. The 32,000-gallon spill temporarily shut down water supplies in the downstream community of Glendive, Montana, after oil was detected in the city’s water treatment system. A major oil spill just 150 miles from the Dakota Access Pipeline protests in North Dakota has validated the concerns of those who spoke out against the project for months, activists said. State officials estimate that more than 176,000 gallons of crude oil has leakedfrom the Belle Fourche Pipeline over the past week into the Ash Coulee Creek in western North Dakota. A landowner discovered the spill near the town of Belfield on Dec. 5, according to Bill Suess, an environmental scientist with the North Dakota Health Department. The leak was contained within hours of its discovery, Wendy Owen, a spokeswoman for Casper, Wyoming-based True Cos., which operates the Belle Fourche pipeline, told CNBC. 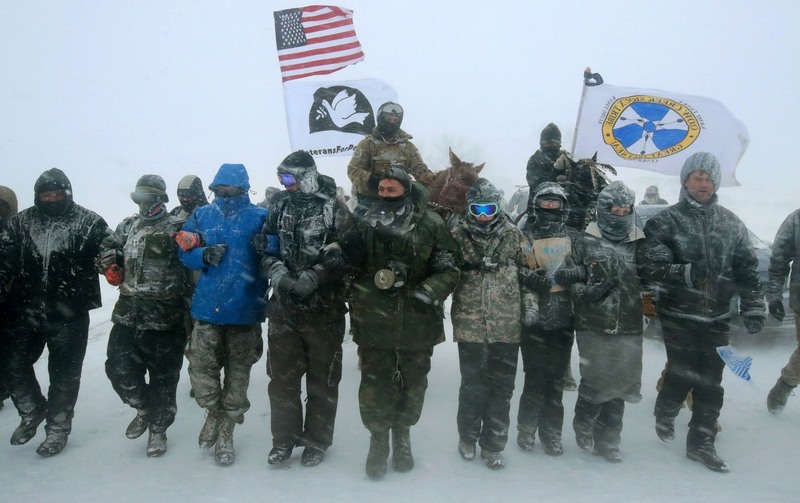 But when news of the spill reached the Oceti Sakowin Camp — where thousands have protested the controversial Dakota Access Pipeline for months — activists said they felt vindicated. One of the protesters’ central arguments for months has been that, despite assurances from Energy Transfer Partners — the Dallas-based company funding the $3.7 billion project — an oil spill would be inevitable. And the Standing Rock Sioux Tribe believes that a spill would devastate the Missouri River, which is the main water source for the tribe. In an interview last month, Energy Transfer Partners CEO Kelcy Warren told NBC News that he could not assure the tribe that an oil spill could not potentially occur. Warren would only say that the Dakota Access Pipeline was prepared to withstand such an event. Warren said the pipeline would cross 90-115 feet below Lake Oahe, a large Missouri River reservoir, with double walled and remote-controlled shutoff valves on each side of the crossing. A spokesperson for Energy Transfer Partners declined to comment for this article. Archambault said he relayed his concerns to North Dakota Gov. Jack Dalrymple on Monday night, their first one-on-one meeting since the protests began last summer. Allison Renville, an activist from the Lakota nation, was less circumspect. “We’re winning,” she told NBC News. The Army earlier this month denied ETP the easement needed to continue their path under Lake Oahe, but many activists fear that the decision could be reversed when President-elect Donald Trump enters the White House. For all of the naysayers who have ridiculed the native people and their concern about the water, here is just what they have been trying to avoid. Another pipeline leak and one near their camp. A couple of months ago there was one in Alabama. After the initial announcement, we didn’t hear any more about it. What about our water in both of these situations? Talking to the EPA and finding out about about your water may be something you want to do before the Inauguration. Trump will probably destroy the agency. We are at a serious impasse with our environment here on our planet and here in America. Here it is made more dangerous by Trump and his denying of science. Yet we have the entire city of Flint, Michigan that has not had clean drinking water for at least the last two years. Congress is just now appropriating money for Flint. We need to continue to give the native people our support and prayers that this stand off at Standing Rock comes to an appropriate end for the people and the land. I stand with Standing Rock. This entry was posted in Rebel Posts and tagged another pipeline leak, fossil fuel, native people, oil leak, protests, validation, water protectors. It’s bad when oil spills and caps rupture, like in our Gulf. But clean up , when done responsibly, has even enriched the environment. It’s never good when there is a spill and it effects land and wild life. However, we live in the 21st century and until we can find a better way, it’s still the safest way to tansport crude oil. I believe the protests are not really about the oil, but more about the land dispute and environmentalists pushing their own interests and using the native American people as pawns to push their own agenda. That’s only my opinion.